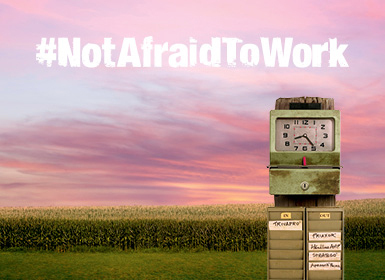 Trivapro works overtime to protect corn, soybeans and wheat against disease and help maximize yield potential. Trivapro® fungicide is a breakthrough product with 3 active ingredients - Solatenol® fungicide, azoxystrobin and propiconazole. This robust combination helps make Trivapro the hardest-working, longest-lasting fungicide on the market with both preventive and curative disease control. With broad-spectrum control of key diseases and plant-health benefits, Trivapro protects crops from multiple sources of stress, allowing the plant to maximize grain-fill by putting more energy toward producing yield instead of fighting disease. Trial Information: Data from 138 non-replicated hybrid/locations in 2016-2017. ROI calculation based on commodity price of $3.50/bu corn, Trivapro cost of $17/acre and $10 R1 application cost. 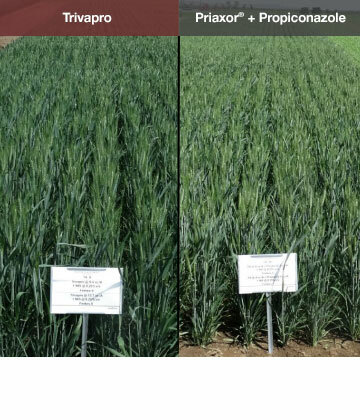 Trivapro-treated wheat is a healthier green in this WA trial. 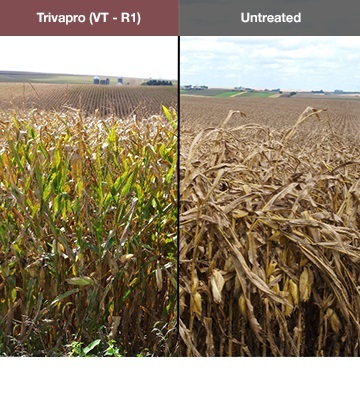 Trivapro increases yield by 3.2 bu/A in this WI trial. 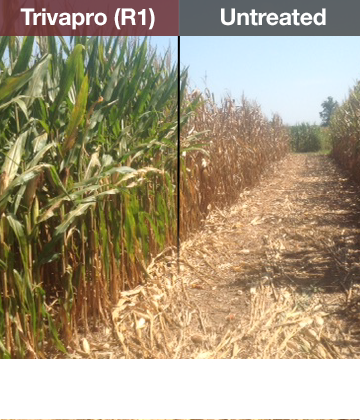 In IL, 46 – 77 bu/A yield bump for 3 Trivapro-treated hybrids. 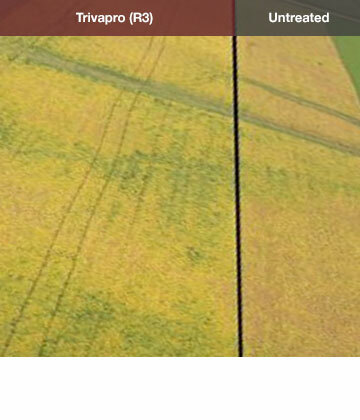 Trivapro delivers exceptional tar spot control in WI. These fields were planted directly across the road from each other, on the same day, with the same hybrid. 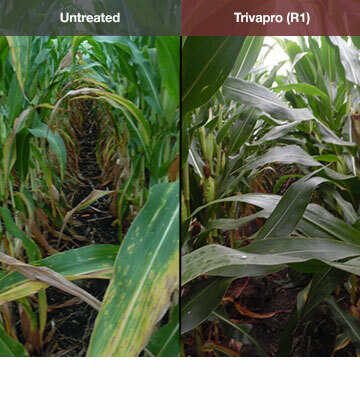 Trivapro provides broad-spectrum disease control in MO. 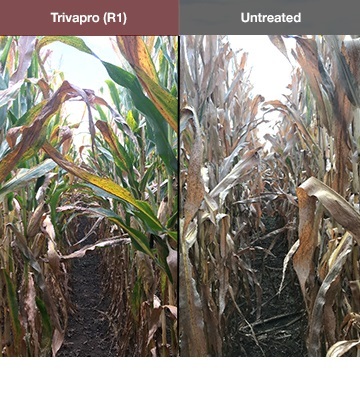 Trivapro defends yield from tar spot in WI. Trivapro outlasts competitive brands in WA. Trivapro yielded 22 bu/A over untreated in IA. Trivapro works hard to help produce healthy soybeans in this OH trial. 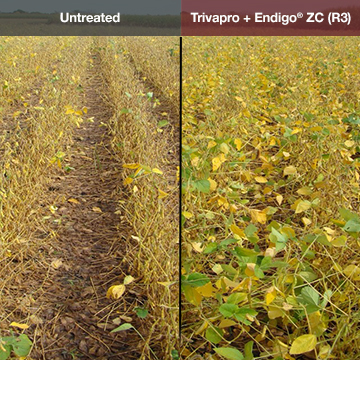 Trivapro preserves soybean plant health in WI. 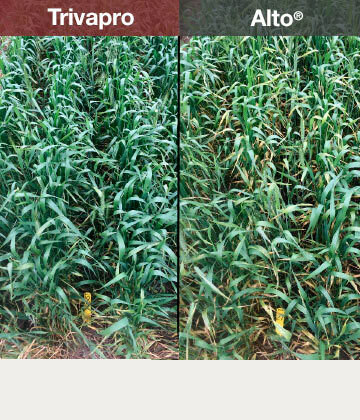 Trivapro preserves green tissue and yield in this 2017 OH trial. 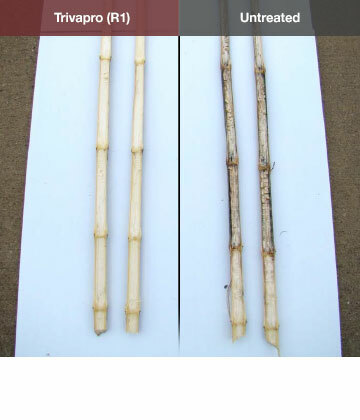 Trivapro enhances stalk strength for improved harvestability in WI. Experience a 360° view of the harder-working, longer-lasting effects of Trivapro fungicide in a virtual tour via YouTube. This virtual tour walks through the 2016 Trivapro efficacy trial at one of Syngenta’s Grow More™ Experience Sites. Use the directional arrows or your mouse to drag the video screen and experience the trial in 360°. Many customers throughout the Midwest, South and Pacific Northwest experienced the long-lasting, potent effects of Trivapro first hand. See what they say about the dependability and length of control Trivapro provides. "If a guy wanted to cut fungicide costs, I’d tell him to get in the combine and see the side-by-side yield. It’ll make them a believer. 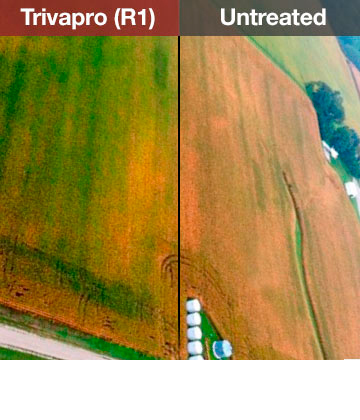 Trivapro fungicide was the best insurance that could be bought in the last two years." "With Trivapro and having the three modes of action, you’re getting a lot more product for the same or less money in some cases. 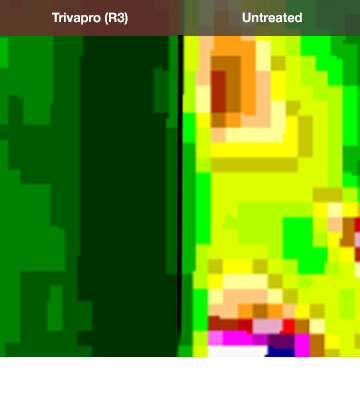 And, in the end we’re getting better control, longer control, which equates to more yield for us." 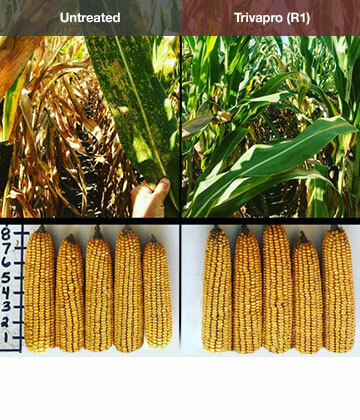 "If a neighbor came to me and asked about using Trivapro fungicide, I would definitely encourage them to try some. I feel like it’s one of the best products on the market as far as controlling Southern rust and extending the window of your protection out into the season as far as you can." "Last year was a tough year. We had a ton of water. This year, we’re running about 25 to 30 percent above our 5 year average. We’re going to give 20 bushels of that to the Trivapro fungicide application." 1 Based on 138 non-replicated trials in the U.S. in 2016-2017. 2 Based on 20 non-replicated trials in the U.S. in 2017. 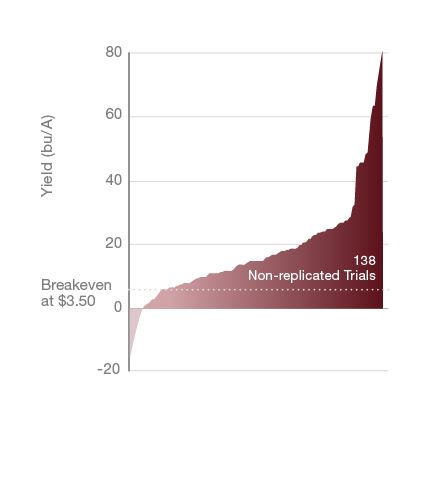 3 Based on 21 replicated trials in the U.S.
4 ROI calculation based on commodity price of $3.50/bu corn, Trivapro cost of $17/acre and $10 R1 application cost. Data from 138 non-replicated trials in the U.S. in 2016-2017. 5 All revenue calculations based on commodity prices of $3.50/bu (corn), $8.50/bu (soybeans) and $4.00/bu (wheat). ©2018 Syngenta. Important: Always read and follow label instructions. Some products may not be registered for sale or use in all states or counties. Please check with your local extension service to ensure registration status. Endigo ZC is a Restricted Use Pesticide. Endigo ZC is highly toxic to bees exposed to direct treatment or to residues on blooming crops and weeds. Do not apply this product or allow it to drift onto blooming plants if bees are foraging in the treatment area. Alto®, Endigo®, Solatenol®, Trivapro® and the Syngenta logo are registered trademarks of a Syngenta Group Company. All other trademarks used herein are the property of their respective company.